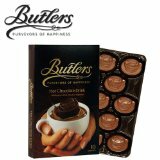 Butlers makes their chocolate using original recipes and chocolate-making techniques handed down from generation to generation. 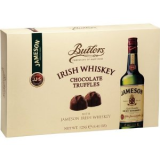 Back in 1932, Dubliners were looking to Europe for new fashions and tastes. 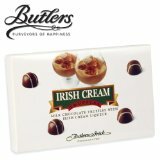 From the heart of Georgian Dublin, a Mrs. Bailey-Butler began to develop a range of handmade chocolates. 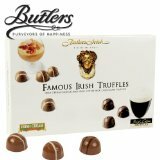 She was soon to become the first and foremost chocolatier in Ireland. 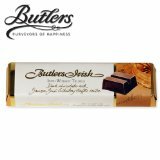 Mrs. Bailey-Butlers chocolates were sophisticated and unusual and they brought a touch of continental luxury to Ireland. 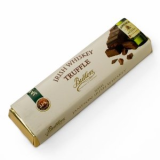 This Irish Whiskey Truffle bar is made from dark chocolate with Jameson Irish Whiskey truffle center. 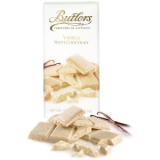 (75g/2.7oz). 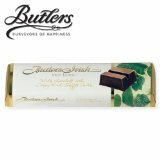 This Mint Truffle bar is made from dark chocolate with a crispy mint truffle center. (75g). 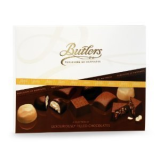 This inviting gift box features two delicious confections hugged in creamy milk chocolate: caramel-filled morsels with a white chocolate stripe and rich pralines with a dark chocolate stripe.